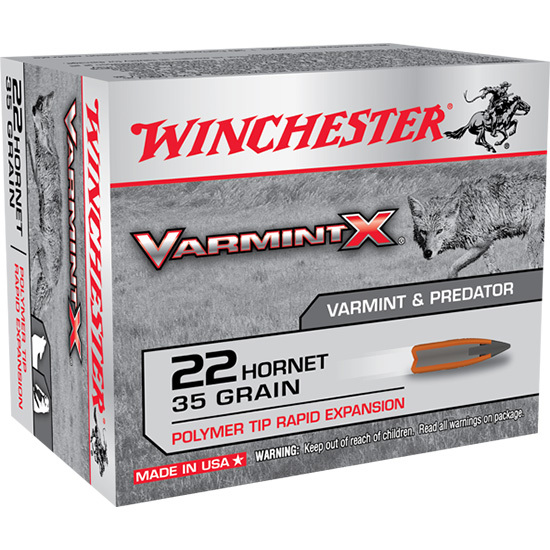 Varmint X is designed specifically for the demands of predator and varmint hunters. The sleek polymertipped bullets are explosive upon impact. Varmint X combines the proven lethality Winchester is known for with todays latest technology giving hunters their ammunition of choice for pursuing everything from prairie dogs to coyotes. The polymer tip maximizes long range performance and promotes rapid expansion. The thin alloy jacket with engineered sidewall profile delivers explosive fragmentation while the lead core is designed for rapid fragmentation on small game.